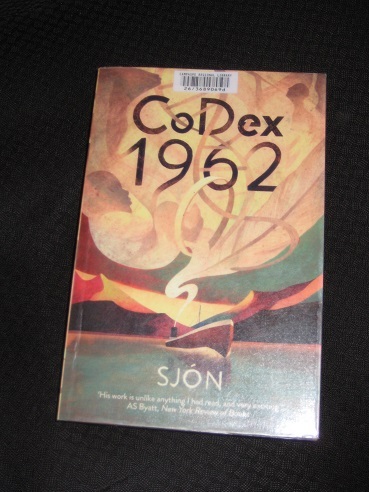 Sjón’s CoDex 1962 (translated by Victoria Cribb) begins in the small town of Kükenstadt in the north of Germany, with a rather chatty narrator revealing (literally) the goings-on inside a guesthouse. Marie-Sophie, a young woman working for the owners, is pressed into caring for a man found hiding in a kitchen cupboard, and despite the inconvenience (and his poor health and hygiene) comes to care for her charge. However, these are dangerous times, with the Second World War going badly for the Germans, and it isn’t long before the man must move on. What follows is therefore based on conjecture and guesswork alone since I myself have never attended a meeting of this organisation. But if you, dear reader, continue with this tale, in spite of my confession that what follows is nothing but make-believe, there’s one thing I can promise you in recompense: it’s an incredibly exciting story that will hold you gripped to the very end. This promise comes from Jósef, the narrator, but it could easily be Sjón himself speaking. One thing you could never accuse him of is being dull. The novel consists of three separate volumes, and by the end it’s clear that each has a different focus, on the mother, the father and the son. The first two parts consist of a combination of the real (the concentration camp escapee, life as an immigrant in Iceland) and the bizarre (the appearance of a dead child murderer and the man who killed him in turn, werewolves (yes!) in Reykjavik), although the difference between the two isn’t always as clear-cut as you might expect. As we learn more about the origins of the boy made of clay, we slowly start to get an idea of what’s happening. However, after the first two parts, most readers will still feel rather in the dark. In fact, the book seems to spring from the idea of the children of 1962 (of whom Sjón, if you hadn’t guessed, is one), with Jósef as a representative of the generation, perhaps based on someone the writer knows. The third part includes scenes of the dead coming together, growing in number as time passes and the death toll, from natural causes or otherwise, mounts. The motto of the book could be the eerie refrain “Dear brothers and sisters, born in 1962, we await you here” that echoes through the final part of the story, turning the work into an homage to those who left their lives too soon. With such an array of styles and stories, the reader must be constantly on their guard, trying to pull it all together to see what relevance all this has to Jósef’s story and where the narrative will take us next. However, despite the undoubted craft that has gone into the book, I’d be lying if I said I was always on board with the writer’s games, mostly because there were times when I seriously doubted that the plot was going anywhere. The three books of the trilogy were actually released at separate times in the original Icelandic (the first book appearing in 1994), and it’s hard not to think that the novel developed organically and only eventually became a trilogy. The book isn’t entirely coherent, with the third part having to explain away a lot of what went before – it didn’t always convince me, and the epilogue to the work seems tacked on rather than conclusive. I don’t think I can be overloaded by tangents. I don’t mind novels that are 100% tangent. Or as close to 100% as is possible. I feel there used to be quite a lot more of those, back in the 1980s and 1990s. Novels that were only just barely novels. I struggled through the first part of this novel (kept re-reading pages in order to visualize his images) and quit shortly into the second part because it became even more frustrating (the bird in the mouth segment was just too weird). I will admit that I am trying to read as many books from the Goodreads contender list as possible and – after reading your review – may have been too anxious or impatient. As an aside, the same thing happened last year with Milkman (we know how that turned out), but I eventually made it through that one and glad I did. But I digress. I won’t be putting this on my longlist predictions, but if it appears there I will certainly make another attempt.